Do you love going to gigs and listening to the music of the bands you grew up with? Then join us! We're all about supporting 'classic' artists and their new ventures. Thankfully, due to their enormous talent, many of these legendary musicians have been around for decades. They're still out touring, recording and performing to capacity crowds despite the lack of adequate publicity and airplay in mainstream media. Their music has been the soundtrack to our lives and they've proved YOU'RE NEVER TOO OLD TO ROCK'N'ROLL! Established in 2008 because we feel older artists are not getting a fair go in today's media even though they still have so much to offer the music industry. In today's disposable music world, they're timeless. Let's give them the support they deserve! They're still out there performing to sell-out crowds and putting some of the younger bands to shame with their energy and showmanship. We also want your input. Share your memories, photos, ideas and reviews. Not over 40? That's okay, we won't hold that against you cos you can never be too young to rock'n'roll either! You're welcome here as long as you love the music we're into! It's free to join so what are you waiting for? They say "Life Begins at 40" so come on, we've got a lot of livin' to do! A big thanks goes out to the artists, their management, promoters and publicists who support our mission and have helped turn this site into a reality. We look forward to being of assistance to you in the future. Just a note that spam and abusive comments will not be tolerated, you will be deleted and blocked. If you would like us to cover your event, then please do not hesitate to contact us on info@rockclub40.com. Albums for review can be posted to PO Box 7094, Mount Annan NSW 2567. The information contained in this website is for general information purposes only. 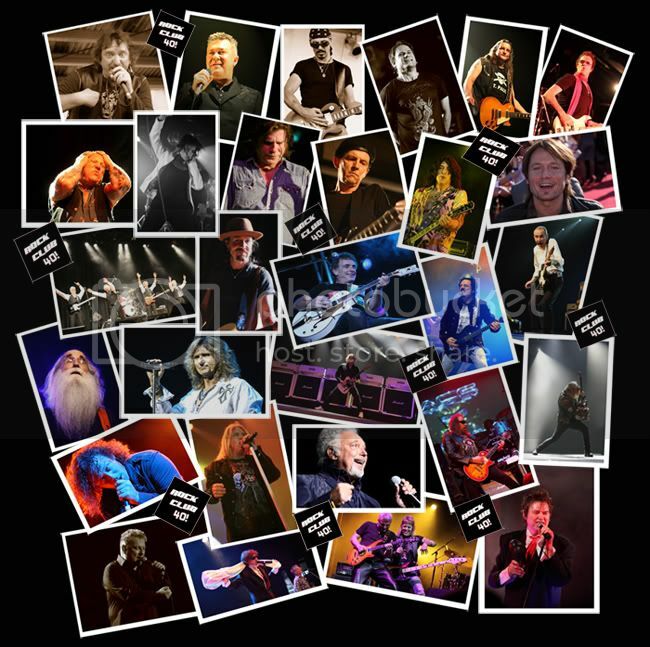 The content is provided to Rock Club 40 by reliable and respected industry sources. Whilst we endeavour to keep the information up to date and correct, we make no representations or warranties of any kind, express or implied, about the completeness, accuracy, reliability, suitability or availability with respect to the website or the information, products, services, or related graphics contained on the website for any purpose. Any reliance you place on such information is therefore strictly at your own risk. Through this website you are able to link to other websites which are not under the control of Rock Club 40. We have no control over the nature, content and availability of those sites. The inclusion of any links does not necessarily imply a recommendation or endorse the views expressed within them. Every effort is made to keep the website up and running smoothly. However, Rock Club 40 takes no responsibility for, and will not be liable for, the website being temporarily unavailable due to technical issues beyond our control.